This week I've been poring over my growing collection of vintage magazines, and as a result have been thrown into the fire of ideas and inspiration. One of my favorite thing to read in these issues (other than the fictional short stories to keep those housewives entertained) is the ads, because, unlike now, they were crafted for people with much longer attention spans who had time to soak in information. So instead of quick and catchy, the text is longer and oftentimes really amusing. I also love a lot of the product designs, too. So much simpler and a kind of "modern" that doesn't make your head spin. "Nutty-but-nice: Give pecan halves a kicky new taste by tossing them with Kraft French Dressing (the creamy, savory one the whole family likes)...before toasting them in the oven. Add these to a fruit salad (whatever you have, fresh or canned). 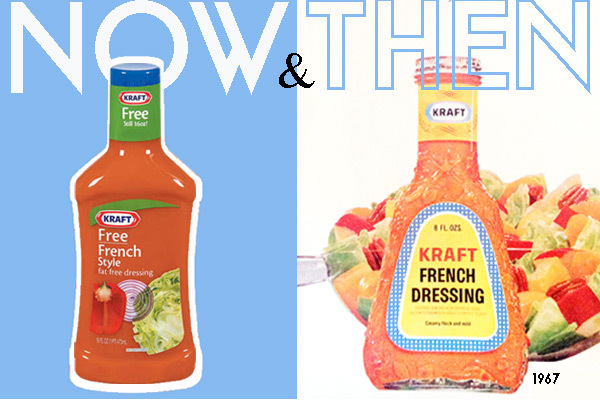 Toss with more Kraft French. If they eat up every bite and ask for more...don't say we didn't warn you!" Things I love about the design: the glass bottle, the color combination and, in the label across the neck, these beautifully delicate swirls around the "Kraft." Actually, the neck label design is kinda my favorite part of the whole bunch.